Promotional bond certificate from the San Diego Heaven on Earth Club printed in 1938. This historic document has an ornate border around it with a vignette of San Diego Bay with the sun setting in the background. This item has the printed signatures of the Heaven on Earth Club and the Royal Domain of the Weather Kings. 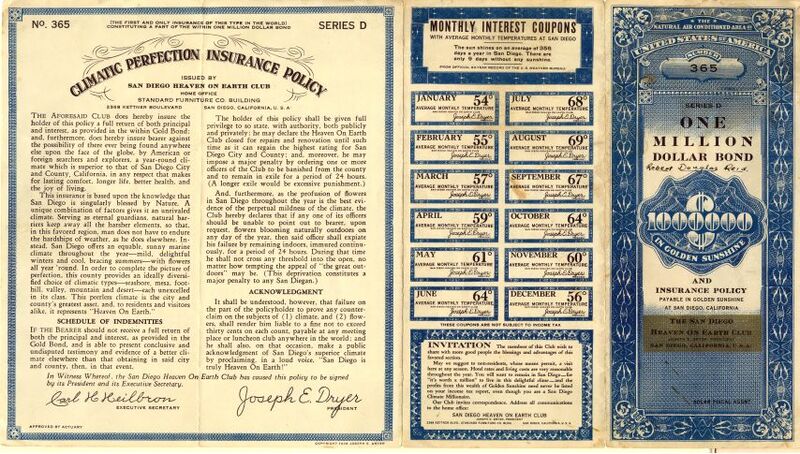 This promotional three-color insurance bond indicates the enjoyable life in San Diego, California. "This supply of Golden Sunshine is guaranteed, in perpetuity, by the San Diego Heaven On Earth Club, which hereby provides this official assurance: that Gold, in this form and of this consistency, shall never be withdrawn from circulation within the boundaries of this area; that it shall not be sealed and hidden behind dark rain-cloud, except ...."
This bond would look terrific framed. Price: $85.00 Add to Cart Ask a Question See all items in U.S. - Western States (TX, NM, AZ, UT, NV, CA)	The Natural Air Conditioned Area of United States of America. Number 365 Series D One Million Dollar Bond. $1000000 In Golden Sunshine and Insurance Policy Payable in Golden Sunshine at San Diego, California. CALIFORNIA - SAN DIEGO.